Ok show me your pumpkin carving skills. I wish to see them! Post pictures here, bonus points if your standing in the shot with it. Triple bonus points if you're also in costume. You have till the 5th of November. Also no, no-one gave me permission to do this, so this is an unofficial contest. Well? Get to it ! this doesn't fulfil the criteria, but I'll still post it, because this contest inspired me. 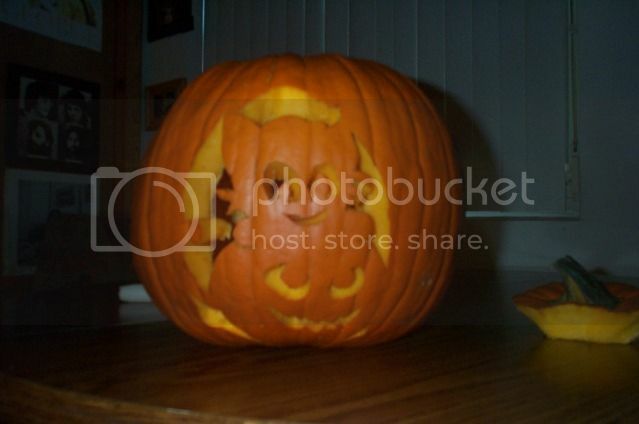 Will an old pic of an old jack-o-lantern do from one I carved, last year? Oh snap! A challenger appears. I remember that pumpkin! Lol I'm allowing it since I remember it. Lol yes you are still in the running cause effort to participate counts for something, imo. when I posted those, I didn't ever think about joining. Due to having to completely reinstall my windows, I forgot to call time. Either way submissions are over. You both win, thanks for playing. Now decide between you which one gets the painting (which i'll post on here when my computer is finished fixing itself) and which one of you gets my respect. I don't need respect, I only want material possessions! no, I'd rather have the respect, simply because my walls are already full and I live so far away. I also didn't join because I was interested in the painting, I only joined for fun. I joined for fun, too. there might be some jealousy issues if there's actually some good artwork hanging along with the bad, which might put your lovely painting at grave risk of vandalized. I would hate for such a terrible thing to happen to such a wondrous creation of such a beloved Ocean. I'm afraid I will have to decline the offer of a painting. Might I suggest donating it to the Louvre? It'd definitely be a rare and unique piece for them. How many paintings do they have that were done by large bodies of water? Louvre? do you want to insult the Ocean's paintings? they deserve something better! It's better than being destroyed by racist artwork. *sigh* okay, I'll take the painting and you get the respect. then the paining would at least be close to another masterpiece of art. I am talking about myself of cause. how about you take both the Respect and the Painting... I don't mind. that's actually a serious idea. why don't both of us get halve of the painting? nah... It's okay, Kronus. Really. Keep the painting as well. Half a painting on my wall might still get vandalized. At least with you, it'll be safe.